The Global Volcanism Program has no activity reports for Karapinar Field. The Global Volcanism Program has no Weekly Reports available for Karapinar Field. The Global Volcanism Program has no Bulletin Reports available for Karapinar Field. The basaltic Karapinar volcanic field is comprised of five cinder cones, two lava fields, and several explosion craters and maars located along a SW-NE line on the Konya-Eregli plain SW of the Karacadag stratovolcano. The maars evolved from hyaloclastite tuff rings to maars to cinder cones, reflecting varying lake water levels during eruptions. Meke Dagi is one of the largest cinder cones in Central Anatolia. Blumenthal M M, van der Kaaden G, Vlodavetz V I, 1964. Turkey & Caucasus. Catalog of Active Volcanoes of the World and Solfatara Fields, Rome: IAVCEI, 17: 1-23. The Global Volcanism Program is not aware of any Holocene eruptions from Karapinar Field. If this volcano has had large eruptions (VEI >= 4) prior to 10,000 years ago, information might be found on the Karapinar Field page in the LaMEVE (Large Magnitude Explosive Volcanic Eruptions) database, a part of the Volcano Global Risk Identification and Analysis Project (VOGRIPA). There is no Deformation History data available for Karapinar Field. There is no Emissions History data available for Karapinar Field. 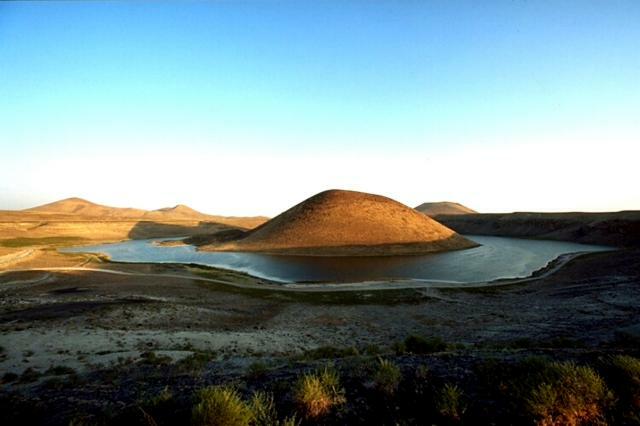 Meke Golu lake surrounds the Meke Dagi cinder cone in the Karapinar volcanic field, which is comprised of cinder cones, lava fields, and maars on the Konya-Eregli plain. The 300-m-high Meke Dagi is one of the largest cinder cones in Central Anatolia. This maar complex evolved from a hyaloclastite tuff ring to a maar to a cinder cone, reflecting varying lake water levels during the eruption. "Meke" in Turkish means "smelling" ("Golu" is "Lake"): the water is full of sulfur bubbles from underwater solfataras. Copyrighted photo by Marco Fulle, 1999 (Stromboli On-Line, http://stromboli.net). There are no samples for Karapinar Field in the Smithsonian's NMNH Department of Mineral Sciences Rock and Ore collection. Large Eruptions of Karapinar Field Information about large Quaternary eruptions (VEI >= 4) is cataloged in the Large Magnitude Explosive Volcanic Eruptions (LaMEVE) database of the Volcano Global Risk Identification and Analysis Project (VOGRIPA).